The finding could change ideas of how and when complex life evolved on Earth, and how likely it is that it could evolve on other planets. Oxygen in the Earth's atmosphere is necessary for complex forms of life, which use it during aerobic respiration to make energy. The levels of oxygen dramatically rose in the atmosphere around 2.4 billion years ago, but why it happened then has been debated. Some scientists think that 2.4 billion years ago is when organisms called cyanobacteria first evolved, which could perform oxygen-producing (oxygenic) photosynthesis. Other scientist think that cyanobacteria evolved long before 2.4 billion years ago but something prevented oxygen from accumulating in the air. Cyanobacteria perform a relatively sophisticated form of oxygenic photosynthesis -- the same type of photosynthesis that all plants do today. It has therefore been suggested that simpler forms of oxygenic photosynthesis could have existed earlier, before cyanobacteria, leading to low levels of oxygen being available to life. Now, a research team led by Imperial College London have found that oxygenic photosynthesis arose at least one billion years before cyanobacteria evolved. Their results, published in the journal Geobiology, show that oxygenic photosynthesis could have evolved very early in Earth's 4.5-billion-year history. 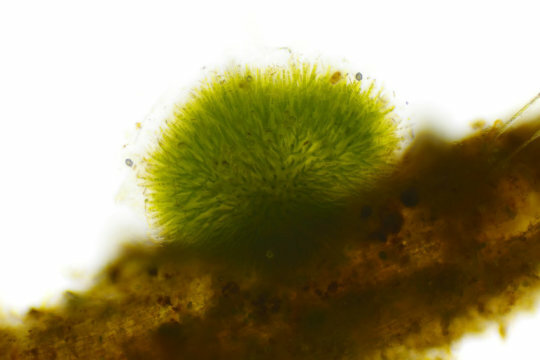 Lead author Dr Tanai Cardona, from the Department of Life Sciences at Imperial, said: "We know cyanobacteria are very ancient, but we don't know exactly how ancient. If cyanobacteria are, for example, 2.5 billion years old that would mean oxygenic photosynthesis could have started as early as 3.5 billion years ago. It suggests that it might not take billions of years for a process like oxygenic photosynthesis to start after the origin of life." If oxygenic photosynthesis evolved early, it could mean it is a relatively simple process to evolve. The probability of complex life emerging in a distant exoplanet may then be quite high. It is difficult for scientists to figure out when the first oxygen-producers evolved using the rock record on Earth. The older the rocks, the rarer they are, and the harder it is to prove conclusively that any fossil microbes found in these ancient rocks used or produced any amount of oxygen. Instead, the team investigated the evolution of two of the main proteins involved in oxygenic photosynthesis. In the first stage of photosynthesis, cyanobacteria use light energy to split water into protons, electrons and oxygen with the help of a protein complex called Photosystem II. Photosystem II is made up of two proteins called D1 and D2. Originally, the two proteins were the same, but although they have very similar structures, their underlying genetic sequences are now different. This shows that D1 and D2 have been evolving separately -- in cyanobacteria and plants they only share 30 percent of their genetic sequence. Even in their original form, D1 and D2 would have been able to perform oxygenic photosynthesis, so knowing how long ago they were identical could reveal when this ability first evolved. To find out the difference in time between D1 and D2 being 100 percent identical, and them being only 30 percent the same in cyanobacteria and plants, the team determined how fast the proteins were changing -- their rate of evolution. Using powerful statistics methods and known events in the evolution of photosynthesis, they determined that the D1 and D2 proteins in Photosystem II evolved extremely slowly -- even slower than some of the oldest proteins in biology that are believed to be found in the earliest forms of life. From this, they calculated that the time between the identical D1 and D2 proteins and the 30 percent similar versions in cyanobacteria and plants is at least a billion years, and could be more than that. Dr Cardona said: "Usually, the appearance of oxygenic photosynthesis and cyanobacteria are considered to be the same thing. So, to find out when oxygen was being produced for the first time researchers have tried to find when cyanobacteria first evolved. "Our study instead shows that oxygenic photosynthesis likely got started long before the most recent ancestor of cyanobacteria arose. This is in agreement with current geological data that suggests that whiffs of oxygen or localized accumulations of oxygen were possible before three billion years ago. "Therefore, the origin of oxygenic photosynthesis and the ancestor of cyanobacteria do not represent the same thing. There could be a very large gap in time between one and the other. It is a massive change in perspective." Now, the team are trying to recreate what the photosystem looked like before D1 and D2 evolved in the first place. Using the known variation in photosystem genetic codes across all species alive today, they are trying to piece together the ancestral photosystem genetic code.